It has been a week since my last post and I offer my apologies. It has been a hectic few weeks at work and, as a result, I have not been spending much time in the kitchen. Today is finally a day off but, along with the culinary endeavors, many other things have been neglected, as well, so today is one of those “productive” days off. It is still Sunday, however, which always deserves a special breakfast. As you may recall, I rang in 2008 with a New Year’s Pretzel and froze half of the dough for later use. Yesterday I pulled that dough out of the freezer and let it defrost in the refrigerator so that we could enjoy an almost ready-made breakfast this morning. 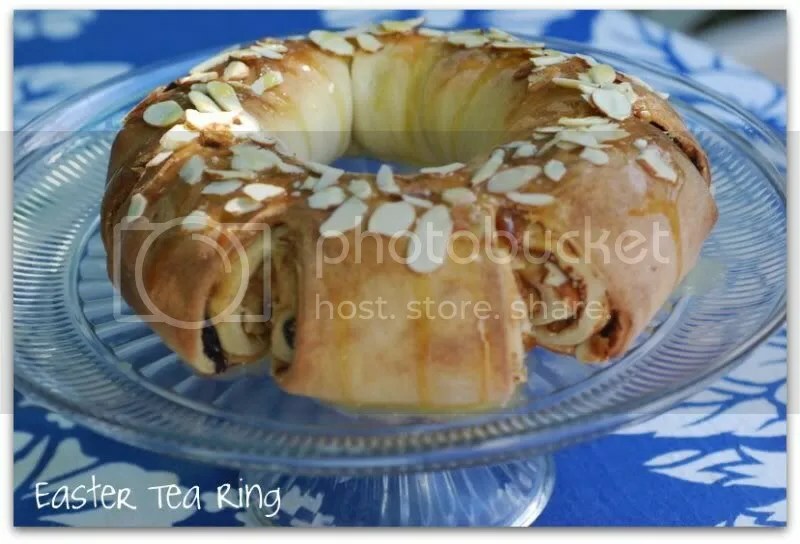 My bread baking cookbook, The Cook’s Encyclopedia of Bread Machine Baking by Jennie Shapter, has a recipe that I’ve had my eye on for some time: an Easter Tea Ring. I decided to make the tea ring today because Dan and I won’t be home for Easter – we’ll be leaving on Saturday to spend six days on Kauai. The book’s version calls for a dried fruit and pecan filling, which I replaced with fresh berries and sliced almonds. I also subbed in the sweet dough from the New Year’s Pretzel. 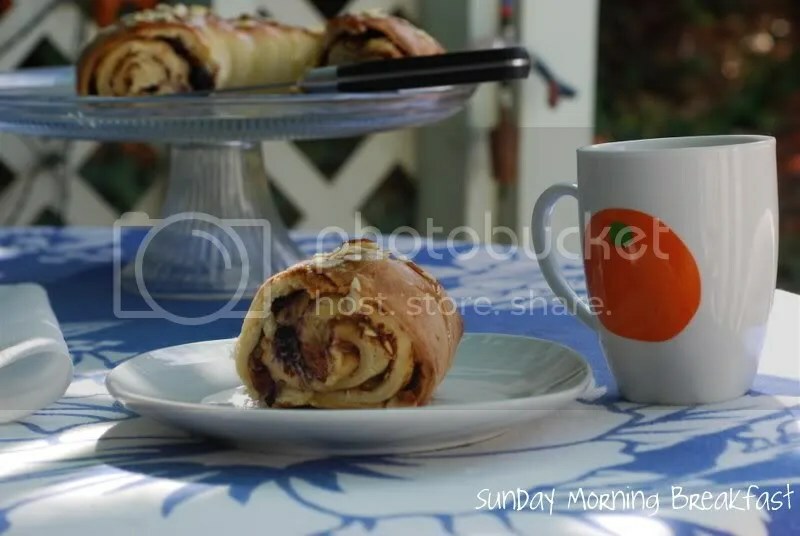 I was able to quickly roll out the dough, fill it, and set it aside to rise for thirty minutes, during which time I weeded out a spot behind the cottage for a new garden plot. Then I popped it into the oven to bake for 30 minutes, during which time I uncluttered the cottage. We then enjoyed the tea ring with a pot of Earl Grey tea on the back deck. This recipe is very easily adaptable to whatever you want to fill it with – be creative! 1. Place the dough on a floured surface and roll it out to a 12” by 18” rectangle. 2. Melt the Earth Balance butter and brush it over the dough. 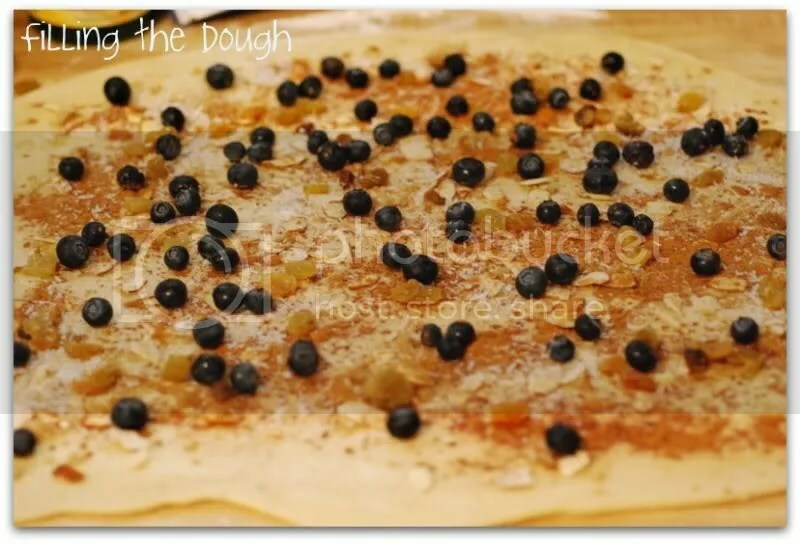 Sprinkle the sugar, cinnamon, almonds, coconut, raisins, and blueberries evenly over the dough. 3. Starting from one long end, rollup the dough (just like when making a jelly roll). Turn the dough, if necessary, to ensure that the seam is on the bottom. 4. Curl the dough into a circle, brush the ends with the remained of the EB, and press together to seal. Place the ring on a lightly oiled baking sheet. 5. Use a pair of scissors to snip through the circle at 1 ½ – 2” intervals, making sure to cut 2/3rds of the way through the dough each time. 6. Cover the dough with lightly oiled plastic and leave it in a warm place for about 30 minutes. Preheat the oven to 400F. 7. Bake the ring for 25-30 minutes, until golden. Cool on a wire rack. 8. While the ring is still warm, make the glaze by mixing together the powdered sugar and orange juice. Place a sheet of wax paper under your cooling rack to catch any dripping glaze. 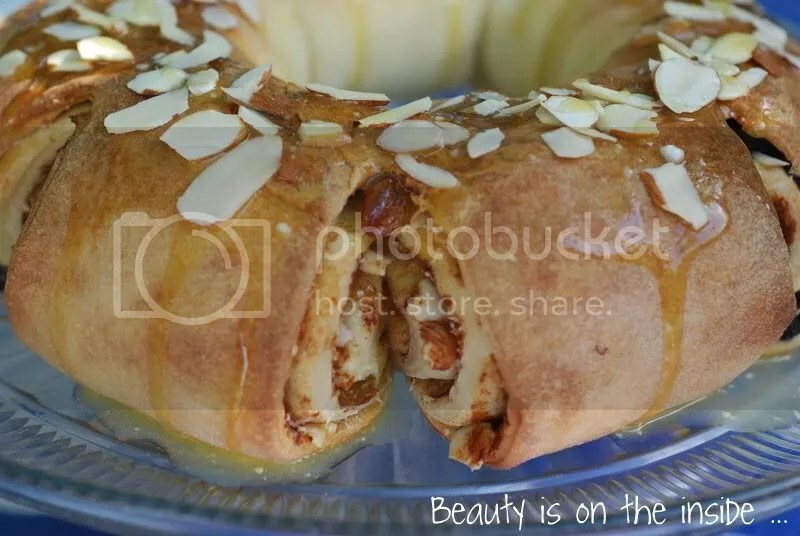 Drizzle the glaze over the ring and sprinkle with sliced almonds. I was squinting for a bit there trying to find your table guest, looking for snakes and frogs and birds…but finally, I see the little guy! 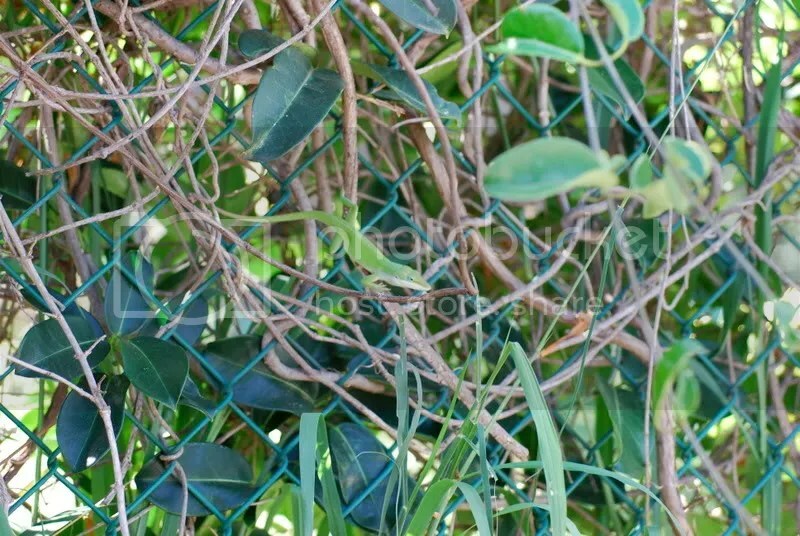 I wish I could brunch with lizards, nothing but hordes of ants around these parts. Ants and snails. You know, Erin, I thought to draw a little arrow in to point out the little guy, but Dan decided it would be more fun to do a lizard version of “Where’s Waldo?”! Sounds like an idyllic breakfast! Makes me want to pack my bags and abandon New England. I love the idea of the ring and your choice for filling looks perfect. Yum.